Recently you may have noticed a trend in our blogging around Bulgur with Turmeric and Cinnamon, but who can blame us? Sunnyland Mills is all about eating healthy and giving our bodies the benefit of nutrition-packed foods. Turmeric has long proven benefits to healthy heart and mind and packs terrific flavor when added to Bulgur wheat. 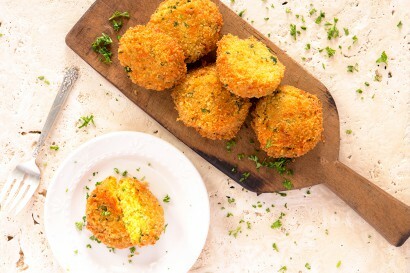 Try this recipe for Crispy Turmeric and Herb Bulgur Cakes at Tasty Kitchen. These bulgur cakes have a delicious crispy outside and a moist, tasty inside from the broth and the turmeric.